Freemasonry, with its commitment to interdenominational and international fellowship, originated in the British Isles. The secret society emerged from the medieval guilds of stonemasons in Britain and Europe that set standards, protected workers’ rights and provided other benefits. Though only Scottish and English associations can be connected to the modern Masonic fraternity, similar craft guilds and companies existed across Europe, playing an important role in the construction of abbeys, cathedrals and castles. Masons’ tools such as the level, square and compass served to underline the fraternity’s values: equality, honesty, spirituality. Freemasonry spread like wildfire throughout Europe and America during the eighteenth century. Hawai‘i was first visited by Freemasons as early as the early-1790s, with the visit of George Vancouver. In addition other lesser known Freemasons (mariners, merchants and professionals) visited the Islands. Oddly enough, it was a French mariner who introduced this British cultural export into Hawai‘i at a time when the Union Jack flew over the kingdom’s capital. On April 8, 1843, during the reign of King Kamehameha III (Kauikeaouli,) Freemasonry was formally established in Hawai‘i by Joseph Marie Le Tellier, Captain of the French whaling barque “Ajax” when he warranted Lodge Le Progres de l’Oceanie No. 124, of the Ancient and Accepted Scottish Rite of the Supreme Council of France. This was the first Masonic Lodge to be instituted in the Sandwich Islands (as Hawai‘i was referenced at that time) and is quite likely the first Lodge to be founded in the Pacific and West of the Rocky Mountains. With it, Freemasonry became firmly established in the Sandwich Islands. In Honolulu, the original lodge members were European and American mariners, shopkeepers and farmers. Membership in Masonic lodges has always served to facilitate business contacts, as well as social ones. By the late-1840s there were about thirty-five merchants and storekeepers in Honolulu, of whom about one third were Masons. Similar ratios existed for the other 150 skilled “mechanics” and professionals in town. Prince Lot was followed into the fraternity by his younger brother Prince Alexander Liholiho, who later became Kamehameha IV, and was the Master of Lodge le Progres de l’Oceanie in 1859, 1861 and 1862. In June 1853, Foreign Minister Robert Crichton Wyllie sent the lodge a request from King Kamehameha III that the reigning monarch be initiated “into our ancient and benevolent order.” Apparently, the lodge did not take the opportunity to enroll King Kamehameha III. In July 1860, the ground breaking for Queen’s Hospital included a traditional Masonic cornerstone laying ceremony attended by thousands and presided over by the young monarch. Later, in 1879, King Kalākaua (one of the most active members of the Craft in the Island Kingdom,) conducted a grand Masonic ceremony at the site of the new ‘Iolani Palace, using Masonic silver working tools specially crafted for the occasion. Other public buildings dedicated under Masonic rites were Ali‘iolani Hale (now home to Hawai‘i’s Supreme Court) and Lunalilo Home. Other notable Masons of that time included John Dominis (husband of Queen Lili’uokalani,) Archibald Cleghorn (Governor of O‘ahu,) Prince William Pitt Leleiohoku (younger brother of King Kalākaua) and Prince David Kawananakoa. During the first decades of Masonic activity in the Islands, Americans constituted 40 percent to 50 percent of all members, and Scots, Irish and English together constituted another 30 percent. Native Hawaiians, on the other hand, comprised no more than 5 to 10 percent of the fraternity, but because they were frequently royalty or important governmental officials, they were highly conspicuous. In 1852, Hawaiian Lodge was chartered by the Grand Lodge of California and all Hawaiʻi lodges became part of that grand lodge from 1902 until 1989, when the Grand Lodge of Hawaiʻi was established. After 137 years to the month (when the Hawaiian Lodge was chartered,) May 5, 1852 – May 20, 1989, of being a part of the California Jurisdiction, Hawai‘i established its own regular Grand Lodge. On May 20, 1989, the twelve Masonic Lodges of Hawaiʻi instituted The Most Worshipful Grand Lodge of Free and Accepted Masons of the State of Hawai‘i. The Grand Lodge of Hawai‘i is the smallest and youngest of American jurisdictions, consisting of eleven constituent lodges and about 1,700 members. Over the years, its members have included three kings, four governors and six chief justices of the Hawaiʻi Supreme Court. 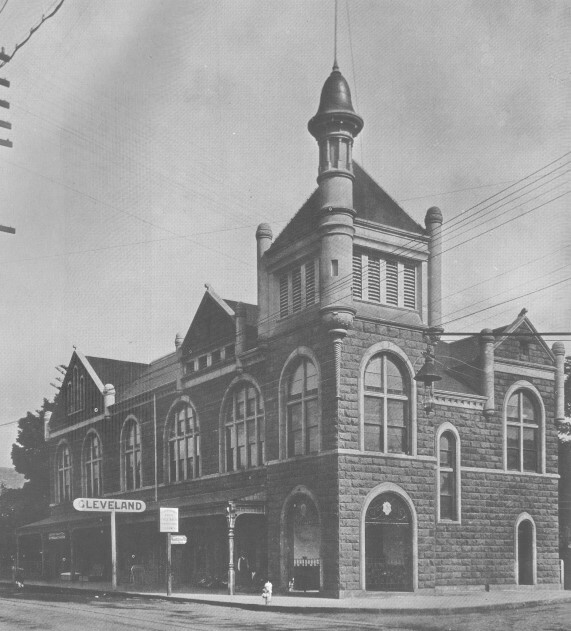 The image shows the Masonic temple on the corner of Alakea and Hotel (1905.) In addition I have added other images related to the property in a folder of like name in the Photos section on my Facebook and Google+ pages. One-and-a-half-million years ago, two large volcanoes emerged and created the island of Molokaʻi, Kamakou in the east and Maunaloa in the west. Somewhat later, a third and much smaller caldera, Kauhako, rose to form the Makanalua peninsula on the north side. Over eons, the north side of the island eroded and fell into the sea, leaving behind the vertical sea cliffs which today make up most of Molokaʻi’s impressive North Shore. It’s the fifth largest island in the Hawaiian archipelago; 260 square miles in area, 38 miles long and ten miles wide at its widest point. Situated in the center of the 8 major Hawaiian Islands, Molokaʻi is 25-miles southeast of Oʻahu, and a 25-minute flight from Maui. From the eastern end of the island, it’s only 8-miles across the Pailolo Channel to Maui. According to the experts, Hawaiians first came to live on Molokaʻi about 650 AD. Those first settlers most likely originated from the Marquesas, with later migrations from Tahiti and other areas in the South Pacific. The oldest known settlement on Molokaʻi occurred in Hālawa Valley, at the eastern end of the island. This side of the island was heavily populated in pre-contact Hawaii, a result of ample water from the mountains, fertile and level land for farming, and a rich and abundant ocean. In November, 1778, Captain James Cook sighted Molokaʻi on his first visit to the Sandwich Islands (as he named these islands,) but it wasn’t until 1786 when Captain George Dixon anchored off Molokaʻi’s coast, that Europeans first visited this island. In 1897, a group of Honolulu businessmen (including Judge Alfred S Hartwell, Alfred W Carter, and AD McClellan) purchased 70,000 acres from the trustees of the Bishop Estate and leased another 30,000 acres from the Hawaiian government. Molokaʻi Ranch was formed. At that time, American Sugar Company began sugar cane production on the lands. About 10 years later, the land was bought out by Charles M Cooke and under his son, George P Cooke, they raised cattle, planted sweet potato and wheat crops and produced honey. It became the second largest cattle ranch in Hawaiʻi and a major producer of beef. In the early days, the focus was on raising beef cattle for market, plus horses and mules for use and for sale elsewhere. Over time, other ventures were tried, with varying degrees of success. Some of these included raising sheep for market, honey production, a small dairy, and various grains and row crops. Between 1923 and 1985, several thousand acres were leased to Libby and Del Monte for pineapple cultivation. During those years, pineapple was an economic mainstay for Molokaʻi. The Cooke family owned Molokaʻi Ranch for almost 80 years until the late-1980s. It was operated as a family corporation separate, from Castle and Cooke. More recently, activities related to the visitor industry were tried. However, in May 2008, the Ranch reduced its operations on the island. Today, Molokaʻi Ranch encompasses about 53,000-acres which is roughly one-third of the island. In 2012, under new management, Molokai Ranch announced plans to develop a new strategy focusing on four strategies: animal husbandry, sustainable agriculture, renewable energy and green improvements to existing infrastructure. Last month, several reports noted that Molokaʻi Ranch will not renew an agreement with Moloka‘i Renewables for a controversial wind farm on its property. 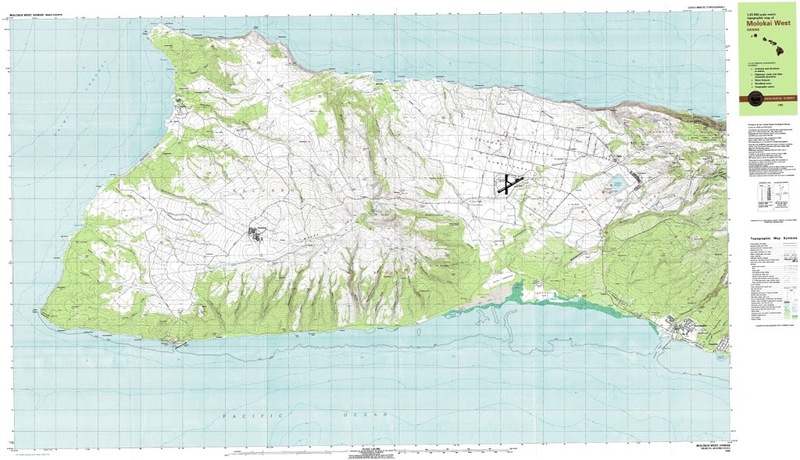 The image shows a USGS map of the west end of Molokaʻi. In addition, I have added other related images in a folder of like name in the Photos section on my Facebook and Google+ pages.